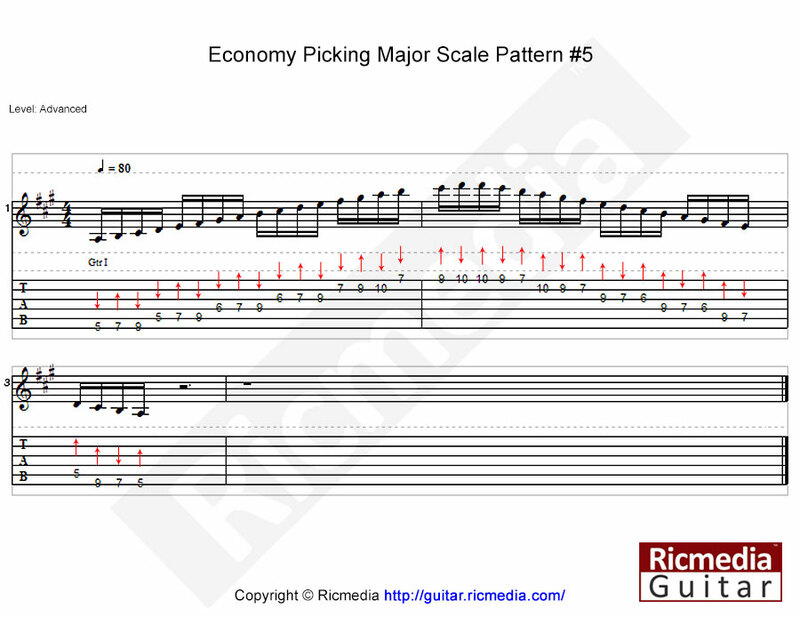 Let's delve into the world of economy picking in today’s lesson, a technique used by some of the worlds most renowned players including Frank Gambale and Yngwie Malmsteen, and a technique well worth your attention, so let’s get straight into it. Economy picking is somewhere in between alternate picking and sweep picking in that when you play a three note per string scale ascending, you would pick down-up-down-down-up-down-down-up etc so when you leave a string with a down pick, the next string will also be a down pick, saving time and effort. Conversely, when descending a three note per string scale, the picking pattern is reversed to a up-down-up-up-down-up-up-down etc, again saving time and effort. let's take a look at the first tablature example below which is a major scale pattern #5, a natural three note per string scale. We start off on the sixth string fifth fret (down pick), then onto the seventh fret (up pick) then the ninth fret (down pick) now we skip to the fifth string fifth fret (down pick), can you see the down-up-down-down picking pattern emerging? Now keep going and finish the scale up to the tenth fret first string, following the red arrows. At this point we have to double pick the tenth fret to keep our pattern and start the ascent. Descending the scale is identical except we simply reverse the down pick with an up pick, to create a up-down-up-up etc pattern, once again follow the red arrows. I will admit, once you get the hang of it, instead of your picking hand lagging behind, you will find its your fretting hand doing the lagging. Once you have this scale down you can move onto the next tablature further below. 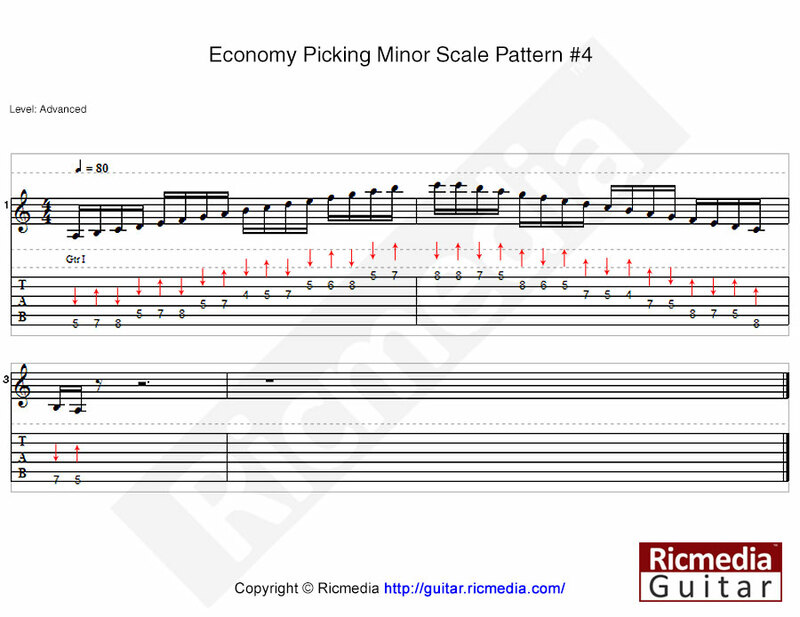 This example uses natural minor scale pattern #4 which is another three note per string scale except for the fourth string, which has only two notes, and is the reason why I am using this scale, as now we will learn how to continue our economy picking pattern even when we are faced with this situation, simply by falling back to alternate picking. We will pickup the pattern on the fifth string fifth fret with down pick, then the seventh fret (up pick) then the eighth fret (down pick), we now skip over to the fourth string fifth fret with a down pick, then seventh fret with an up pick and then skip over to the third string with a down pick, and continue our economy picking from this point. This switch should feel reasonably comfortable and shouldn’t pose a problem for most. Now we start our descent and reverse our economy picking pattern by double picking the eighth fret (follow the tablature and the arrows), when we reach the fourth string we play the seventh fret with an up pick (following on from the previous up pick), then a down pick for the fifth fret, we then skip to the fifth string eighth fret with an up pick, then continue or economy picking pattern from this point. Again the switch should feel comfortable. Make sure you memorize picking patterns and scale patterns before using a metronome and certainly before trying to speed things up, just take it nice and slow in the beginning and gradually build up speed. I hope you enjoyed this lesson and got something out of it, and perhaps even convinced you enough to start using economy picking in your regular playing style.